Sandy Frank believes in fitness. It is a requirement for her job as a National Guard soldier, but is also a way of life. That person likes to be organized and wants everything in an orderly manner. Sandy said she thinks that will be a benefit to her new job as the administration assistant at the Mobridge Area Chamber of Commerce. She is the middle child of Mick and Rita Frank. She was raised on a ranch north of Isabel. She has an older sister Patty and a younger brother Michael. Sandy lives with her partner Corson County Deputy Mark Bilben, who is also a member of the National Guard. They met seven years ago through the Guards. They have two dogs, Kenna, the “spoiled princess” Chiweenie, and bulldog Emma. Sandy graduated from Isabel High School in 2009 and for a short period of time attended the University of South Dakota for Health Sciences, but came back to the Mobridge area and joined the National Guard. She has been with the 200th Engineer Unit based in Mobridge since 2012. 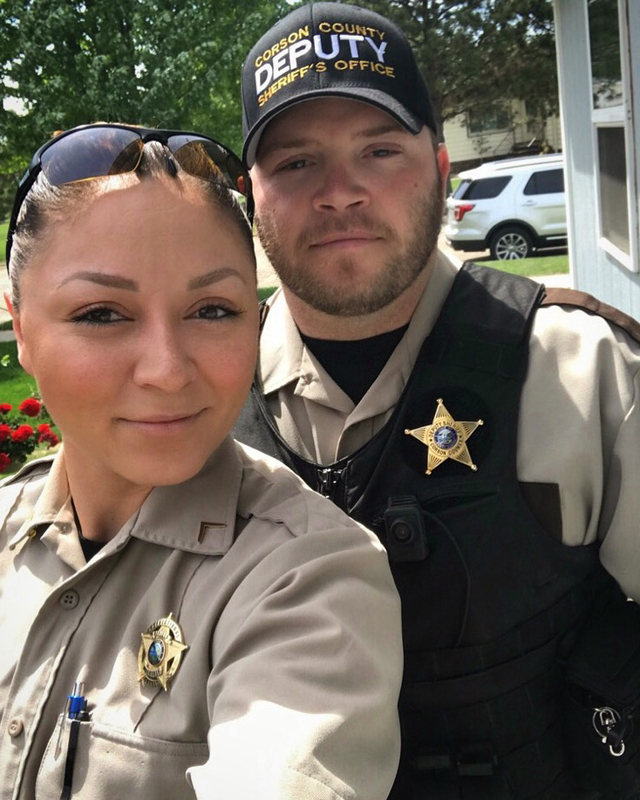 She has worked with the Cheyenne River Sioux Tribe Law Enforcement Agency as a Correctional Officer, was an assistant plant manager for the Medicine Wheel Village and in 2017 moved back to Mobridge area to take a job at the Walworth County Jail as a correctional officer and assisted in the field training of other officers. She continues to work at the jail on a part-time, as needed basis. She recently re-enlisted in the National Guard for six more years and will be returning to the 200th Engineer Unit after being detached for a year to the Recruit Sustainment Program at Camp Rapid, in Rapid City. She was a Cadre Instructor for the recently enlisted soldiers who have joined the Guard, teaching them what to expect when they go to basic training and how to be a soldier. She and Mark are weight lifters and she works out year round, seven days a week. She lays off for a couple of months before the required National Guard physical training test, in order to lose a bit of muscle. “It is hard to get through that two mile run when I’m bulked up,” she laughed. She does most of the cooking, but Mark cooks for her sometimes. They like to use smoked salmon, chicken, turkey and spinach in their meals and have a great recipe for sushi. Sandy said they also enjoy their “good rib-eyes,” along with their healthier diet foods. She began her new duties at the Chamber last week and is excited for the new opportunity. She is glad to have the opportunity to give back to her community through her j new job. When they are not working or working out, Sandy enjoys spending time with family, outdoor activities, hunting, fishing and camping. 2. Combine softened cream cheese, sour cream, cheddar cheese, bacon, and chives. Spoon mixture into a 1-quart baking dish and bake for 25-30 minutes or until cheese is bubbling and hot. (Can save some of the chives and sprinkle on the top for extra). Serve with dehydrated bagel chips, garlic bread slices, crackers, pretzels, or veggies. Great for parties! 1. Preheat oven to 350. Coat 8 muffin cups in muffin pan with non-stick cooking spray. Gently press a ham slice onto the bottom and up the sides of each prepared muffin cup. 2. Break 1 egg into each of the 8 muffin cups containing the ham slice. 3. Bake for 10-18 minutes until whites are completely set and yolks are thickened. 4. Remove from oven. Take a fork and gently slide each ham and egg cup out onto a plate. 5. Sprinkle some of the diced cherry or grape tomatoes and chives over each ham and egg. 1. Lay tortillas on a clean flat surface. Place about 1/2 cup of cup chicken, 1 Tbsp. ranch, 2 Tbsps. of cheese, and 1 Tbsp. of minced cilantro on each tortilla. Fold tightly to form a burrito shape. 2. Heat a heavy-duty pan or grill to medium heat. Coat with a light layer of oil (I prefer virgin olive oil) or cooking spray into the pan. Place the wrap into the pan and cook wraps for 1-2 minutes on each side until the tortilla is crispy and golden. Remove from heat and slice in half. Serve immediately. (Can add the sour cream into the shell or use it as a dipping sauce to give it some extra pizzazz! 2. Divide asparagus spears into 12 bundles (3-4 pieces each). Wrap 1 piece of bacon around each bundle starting 1/2” from bottom of the tips. Continue this until all are wrapped. (Can also wrap each asparagus spear individually, your preference). Place bundles into a shallow baking pan. 3. Sprinkle the 1 Tbsp of Ricks Season Salt and 1 Tbsp of Brown Sugar evenly over the bundles. 4. Take the 1 stick of Land O Lakes Butter and shave thin slices square slices over the bundles. 5. Bake 25-30 minutes or until spears have begun to wilt and bacon looks fully cooked. Place 2 frozen bananas into the blender and turn it on to start churning. Add the milk slowly until you have reached your desired consistency. Then add the whey protein powder & cocoa powder to taste. You can use whole milk. It helps with the flavor but if you prefer a lower calorie intake than I would recommend going with almond milk or skim milk. Pour into bowl and enjoy. If wish to can freeze it and will give you that more traditional ice cream texture instead of soft serve.